Biography: Rep. Chad Magendanz (pronounced like Häagen-Dazs) is serving his second term as state representative for the 5th Legislative District, which comprises the eastern third of King County. He’s the ranking Republican on the House Education Committee and also serves on the House Appropriations and House Technology and Economic Development committees. 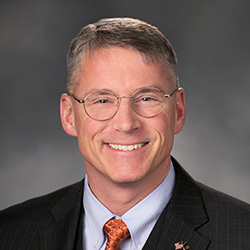 Previously, he served as the Issaquah School Board president and in leading roles of other regional and statewide education-related committees and boards. Chad has an electrical engineering degree from Cornell and served as an officer in the U.S. Navy for 12 years. Having worked at Microsoft for over 20 years in various roles, he still contracts as a software design consultant for many local and international firms. He and his wife of 26 years, Galen, have two teenage boys and reside in Issaquah.